Normally, food shaped like faces is one of my phobias. But these spooky things are supposed to be creepy, so they make sense. Plus, they’re easy to make and your parents won’t gripe about how Halloween food has too much sugar. *Shortcut: if you don’t feel like making crust, use Udi’s bagels, but only if you’re not allergic to eggs. Mix up the pizza dough just like the directions say. Now wait while it sits in a blob for an hour. To make that boring hour go faster, cut the whole lump of Daiya cheese into mummy tape. It’s soft enough for a kid to do it with a not-sharp knife . That’s good exercise and it makes you better at handwriting. Daiya glops, though, so wipe your knife every now and then. When the pizza dough is fat enough, have your grown-up turn the oven on to 375. Wipe or spray grease all over a cookie sheet. Put flour all over your hands. That’s messy and fun. Now you’re ready to divide the dough up into 6 globs. If you know about fractions, this is a good time to brag about them. If not, ask your grown-up to tell you about them because they are spectacular. Then put the 6 globs of dough onto the sheet. When the dough sticks to you, rub yourself with more flour. Flatten the dough globs into mummy shapes. Perfect circles are boring mummies, so screw them up on purpose. Cook those things for 6 minutes then have your grown-up take them out. Brush the melted ghee all over edges of the circles on account of that’s delicious, but it’s not a have-to. 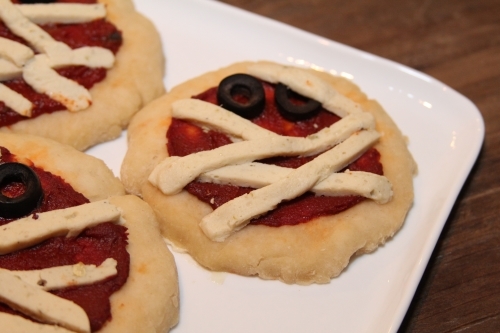 Slop on some pizza sauce, then put the mummy tape all over. Don’t make it straight even if you like straight things on account of mummy tape is messy. Stick the olives on for eyeballs on and cook them for three more minutes. After they’re done, look at how cute they are. Then take the olives off if you think they’re gross like I do. Now eat those delicious things! This entry was posted in Uncategorized and tagged allergen-free, dairy-free, egg-free, gluten-free, Halloween, nut-free, pizza. recipe, soy-free on October 26, 2013 by admin.